Order in the next 3 hours, 15 minutes an 0 seconds for same day shipping. Small and practical, it is ideal for occasional use, both at home or in the office. 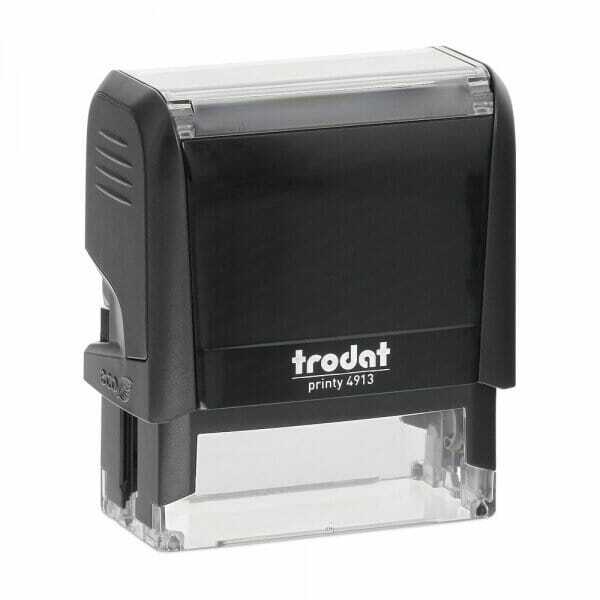 Self-inking Trodat Printy 4913 is produced climate-neutral with maximum possible use of recycled plastic and compensation of unavoidable CO2 footprint by investment in climate protection projects. Create your custom rubber stamp online using the design wizard, personalised with: a message, name, address, signature, email address or contact details. With an added image or logo if required. The 4913 has a maximum of 6 lines. "Trodat Printy 4913 58 x 22 mm - 6 lines"
Customer evaluation for "Trodat Printy 4913 58 x 22 mm - 6 lines"